We collect this information because, if you are approved, lenders will often reach out to you quickly to confirm your loan. Lenders must be able to verify your identity when reviewing your request. If your loan request is approved, lenders use this information to deposit your funds. Your information is protected by 128-bit SSL encryption. ABA/Routing Number Which Numbers Are Which? Some lenders require this information to be able to deposit the funds into your account. 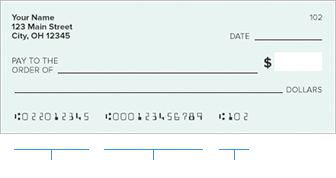 Account Number Which Numbers Are Which? Some lenders require this information to be able to deposit the funds into your account. By entering your mobile phone number, you agree to receive text messages, telephone calls, and prerecorded voice messaging for marketing purposes using an autodialer from Bad Credit Loans, DollarConnect, Marketing Solutions33 LLC, and Sunset Marketing Services LLC at the number you provide. Consent is not required to purchase goods or services. Message and data rates may apply. Receive recurring monthly messages. Follow the instructions on the text message to opt-out.